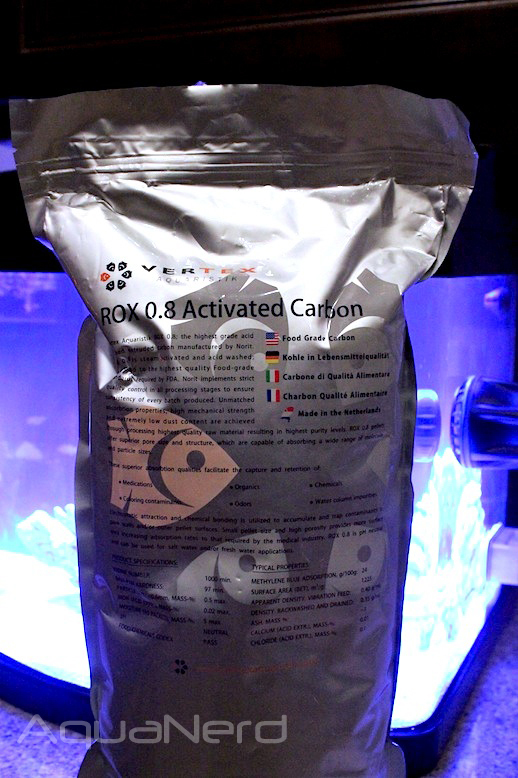 Always on the hunt for something new, we picked up some Vertex ROX 0.8 activated carbon to try out earlier in the week. Now, we’ve handled our fair share of carbon products over the years, trying out everything from the large cylindrical pellets from most brands to the flaky particles of others, but this carbon is unlike all of those and is obviously not something we expected. When we cracked open the bag, we were astonished at how tiny the carbon pellets were. Instead of large pellets that left tons of black residue on our hands, we were greeted with these ultra tiny pellets that were nearly devoid of dust. 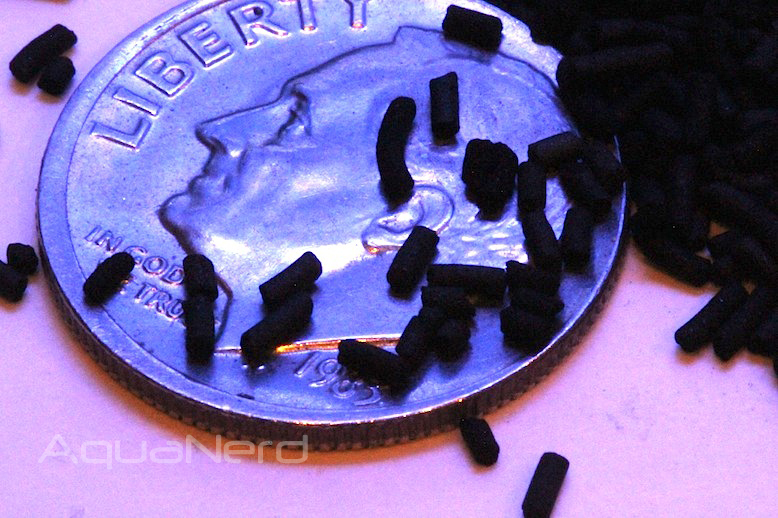 The idea of using tiny pellets of a filtering media instead of larger ones isn’t a new one. It’s common knowledge that smaller grains of media have a much larger surface area, making them more effective at filtering whatever it is their designed to remove. For carbon, however, most companies have been using large grains and pellets. 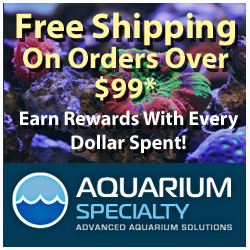 We’re not entirely sure why companies have taken this approach over the years, but we speculate that is has more to do with what other industries are using carbon for, and the aquarium industry just gets whatever is already being produced on the large scale. But I digress. The grains were so tiny, in fact, that a larger number of them could be placed on the face of a dime, as demonstrated immediately above. Unfortunately, because we weren’t expecting such tiny media, we haven’t gotten a chance to actually use it. All of the reactors we have on hand are deigned with larger media in mind, with the exception of our Two Little Fishies PhosBan reactors, which are all running with GFO at the moment. We’ll likely break down a PhosBan reactor in order to run this stuff in our systems, but because it comes from a respected name and because it is just so different than the rest of what’s offered these days, we will expect a lot from it. Not that we could actually quantify how well or how poorly it performs, but we will be watching how the tank responds intently. So what got us on this carbon in the first place? Having tried numerous brands, we felt it was time to branch out somewhat. And of all of the brands listed on the vendor we purchased from, this one seemed to have a lot more in its corner. For starters, there was just so much technical data associated with the ROX carbon. Details like surface area and absorption rates of specific compounds was listed, which means that someone did some homework in testing this carbon before it hit the market. Perhaps this was just a marketing ploy, but it worked and it got us to buy a bag of it. In the coming weeks, we’ll be tossing this stuff on a tank or two to see how it performs. And after we feel confident in our opinion of the carbon, we’ll update accordingly. looks identical to the stuff sold by bulk reef supply and made by Norit the same company, what would have been really been interesting to see on that packet would have been the molases adsorption value that you’d want to be high representing larger moecule size organics found in our tanks values rather than just methelene blue that is just the medium size organics, also Iodine adsorption which you’d want to be low would have been great to see. I would have much rather seen those numbers than vibration feed numbers and FDA approval adding no value unless I was planning to eat the stuff. I would think that Rox 0.8 is the same Rox 0.8 sold by others. We’ve been using it for almost a year. Best carbon we’ve used. Glad you all enjoy my ROX ;-). Norit also makes other “ROX” carbons like ROW 0.8 and ROY 0.8. These are non-acid washed. I hope nobody is substituting these for the real ROX 0.8. Norit no longer gives M# on their data sheet but I do have them.